720 x 720 pixel album cover included with any song purchase. 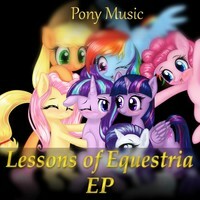 Lessons of Equestria is a compilation of four songs, dedicated to (yet not exclusively) the show and fans of My little Pony. It starts out with some happy DnB and moves on with some rather serious songs of genres like Glitch Hop, Liquid Dubstep (aka Chillstep) and Melodic Dubstep. Shout out to all my friends who helped me out with artwork (FinalAspex, Snowsky-s, ShareDast and Bunnzee). Look em all up on deviantArt.com! Also shout out to all my friends who gave me feedback on my songs! They are numerous but I have to mention HayTea (find him on YouTube) since he invested most of his time. In the rare case you're here before you even checked me out on YouTube, I highly recommend you to do so now. All of these songs will be uploaded there with individual artwork, design and visuals!